The fundamentals of good business management start with the practice owners and managers who make proper business strategy and directional decisions. The MPV Consulting concept involves providing veterinary practice owners, potential owners (and those generally interested in practice management) with tools which they can practically use to improve management and subsequently improve both practice performance and value. 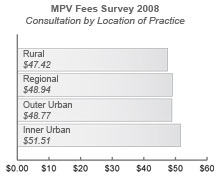 That in the MPV Annual Fees Survey of 2008 the average small animal Consultation Fee was $49.13 including gst.The amount charged for a Consultation Fee depended very much on the location of a veterinary practice.